1. Veil I still wear a commonly veils, cotton paris. And because of this veil has the characteristics of thin and transparent, so I usually wear two veils at once to make it look thicker. This veil does not have the brand since I bought it in the market at a price of 15,000 rupiahs. 3. Cuff Cuff is an additional accessories that commonly used at the end of the hand to cover the wrist perfectly. This time I used two colors cuff without brands. This is one of the items that I sell. 5. Shoes I wore shoes which is also without brand. I bought it in front of the Tanah Abang station some time ago. This shoes is made of rubber. I feel comfortable with rubber shoes because of their soft and light. Besides, when I’m walking, the rubber shoes will not make some noise tak tok tak tok like other shoes. Ukh, that noise was annoying for me. So, that’s all the stuff that I usually use in daily life. Pos ini dipublikasikan di BEC dan tag abaya, bec, blog english club, cuff, ef, english friday, ootd outfit of the day, shoes, socks, veil. Tandai permalink. Hey Utie. I see you are progressing much in writing English. Btw, hope you can grab some customers for your things. Matching beb. 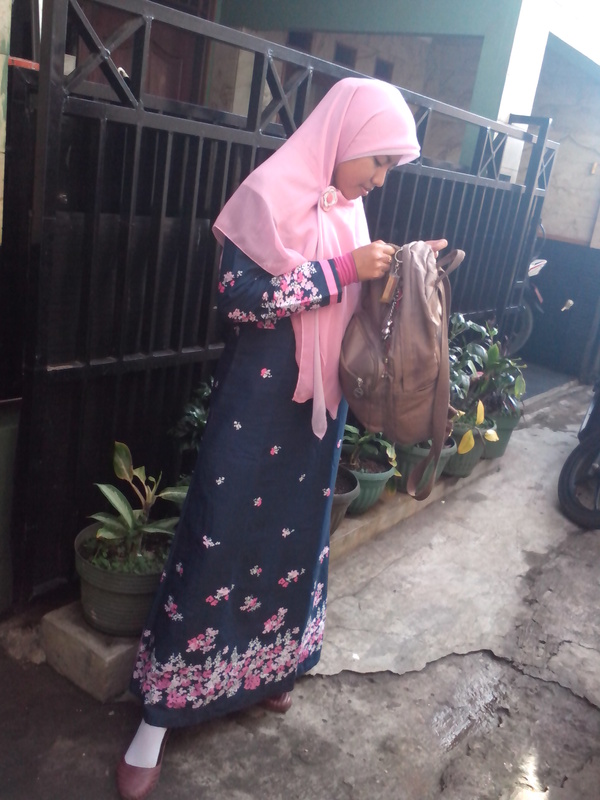 Postingan gw juga navy blue dan pink. Ihik. postingan yg mana tuh Mas? tapi sekarang mah jamannya nabrak-nabrak gitu. Wow, you made the abaya yourself? Amazing! It’s beautiful. Wish you a big hit and many customers for the Abaya. still learning by doing, hehe..
Great, Mbak Utie. Saya dukung pokoknya! You are so amazing, making some of your clothes by yourself. By the way, what is an abaya? Oh, I think I should google it. I’m sorry :hehe :peace.